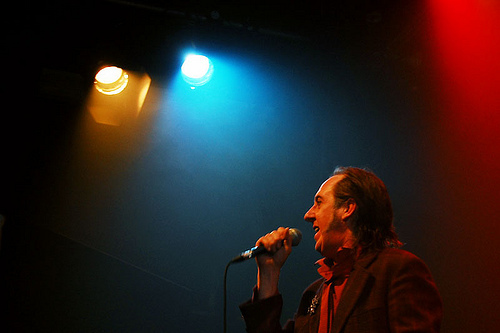 Chris is a cabaret artist, actor and director. 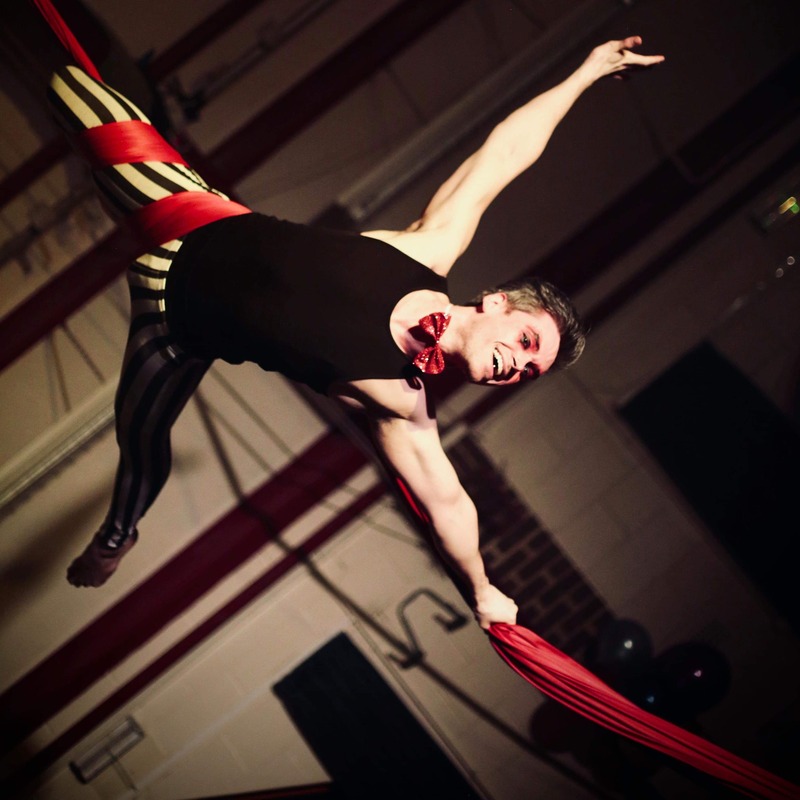 He studied drama at Loughborough University and has an MA in Circus and Theatre from Middlesex University. He is artistic director of Voodoo Vaudeville, and artistic director of junk percussionist Clatteratti. His training and work have included 5 years touring with comedy circus Ra Ra Zoo playing to international audiences including tours of the USA and the Far East. He has appeared on numerous television commercials around the world, as well as appearing on Blue Peter, The Generation Game, and recently appeared as Prodnose in Tim Burton’s “Charlie and the Chocolate Factory”. 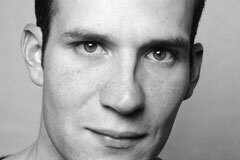 Chris has taught at Circus Space in London, Italia Conti Academy of Theatre Arts, Die Etage Theatre School Berlin and most recently at Chichester University. He is currently director of OldsKool Arts. Baby Warhol is an oracle for the new age, a guru with no message, just a coruscating wit and waspish sense of logic. Whilst bearing an uncanny beyond the grave resemblance, the baby is no relation to the artist. 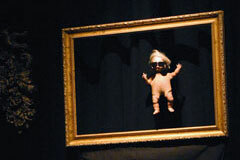 Over the years the baby has built up a reputation for ruthless repartee and a cult following by appearing during other shows including DNA Cabaret and The Lennie and Morris Show manifesting at odd intervals to answer questions from the audience covering the personal, the philosophical and the improper. Knowing that audiences are hungry for the baby he is now in free orbit. Kt has been working with dance in circus, cabaret and street theatre for 35yrs. She’s flown through the air in radical urban street shows, and balanced on anything from motorbikes to Cuban acrobats. In 2002 she co-founded Can Booty Can the notorious Can Can troupe that headlined Lost Vagueness at Glastonbury. 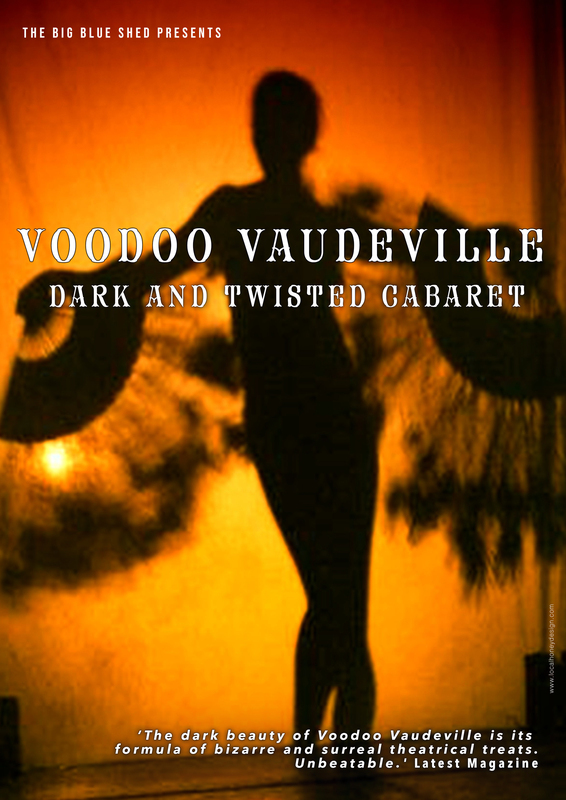 Whilst kicking her legs in the air she discovered the delights of Voodoo Vaudeville and started performing and co-directing some of the crazy scenarios and dances that make Voodoo Vaudeville the unforgettable experience that it is. 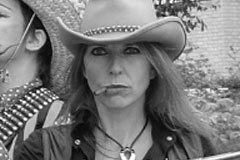 In 2008 Kt formed her own company Copperdollar, producing/artistically directing and performing in shows that have been touring at International street theatre festivals for the past 10yrs and gained a cult following at Glastonbury Festival with their show “The Back of Beyond”. Recently Kt has been collaborating with Chris Cresswell and Holly Ray pooling their strengths to give Voodoo Vaudeville a new lease of life. Holly has been dancing since the age of three, and went on to train at Bird College where she gained a BA (Hons) in Dance and Theatre Performance. Her experience is extensive, including west end and touring theatre roles, drama, commercial and contemporary dance, cabaret, and film. She also works with young people aged 2-19 and directs youth productions. Holly has been collaborating with Voodoo Vaudeville for nine years, both choreographing and performing a range of work. Laura began her dance training from the age of three. She started with ballet, then went on to learn tap, modern, jazz, contemporary and lyrical. Whilst training she took part in many competitions and shows, then in 2010 graduated from Winchester University with a degree in Choreography and Dance and Performing Arts. It was a couple of years later when she discovered the hoop, and soon became captivated by the wonderful world of flow arts, incorporating all of her dance training into these new skills. 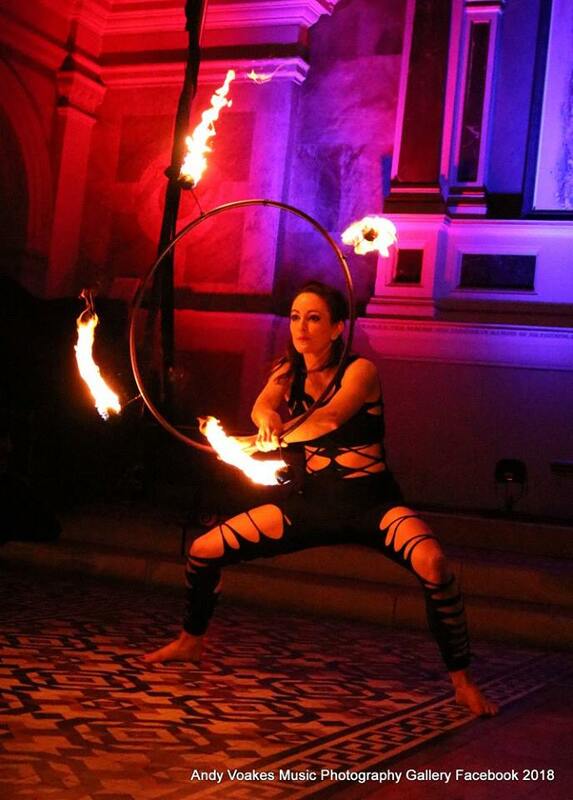 Fire hoop, fire dancing, body burning and fire eating soon became second nature and she realised that flow arts and fire performing was something she would like to pursue. In 2015, she went to Romania with a charity called The Flying Seagull Project. They went to various orphanages and schools, putting on shows and running workshops in music, circus and dance. In 2016 she went to Cambodia where she performed and led workshops at Freeflow Fire and Arts Festival, then onto Thailand where she performed at Shambhala In Your Heart Festival. Laura has been working with Voodoo for the last 2 years. Dan Shelton trained in the depths of the Voodoo Vaudeville dungeons a physical performer who has been a clown, a gorilla and a circus strongman. Since 2001 he has been performing with High Spin dance company, touring festivals and events angle grinding and stiltwalking with WE3, posted himself to Tate Britain after winning the creative minority award, and passed on his skills as a workshop leader with young people and community groups. Dan is currently training at Central School of Speech and Drama exploring screen acting. Kellie Sky has been performing aerial for 10 years, after a degree in physical theatre she took her theatre into the air: climbing, wrapping, twisting and spinning up high, this is where she feels most at home. Performing with various companies such as shambolic sideshow, flying eye, B-collective, pazzaz circus, Warner bros & Dartmoor events, and at events from chic ballrooms to the muddy fields to the bizarre places like trains! Kellie is touring this summer with Airteko for Sea Shepherds. 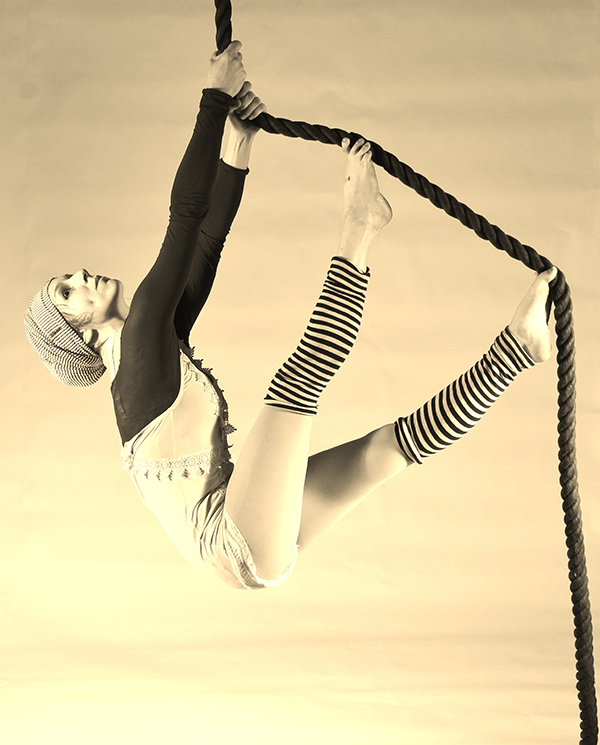 Kellie runs Teardrop Aerial & Circus: teaching children and adults and regularly teaches for Bandbazi. Tamati came to a show in 2018 and decided that we needed him as much as he needed us. Tami is an accomplished aerialist teacher, fitness instructor and so much more! Personal trainer and aerial instuctor by day as AcroBody. Been practicing aerial for almost 3 years and his weapon of choice is the silks because he loves the drama. His other passions in life include vodka and puppies. 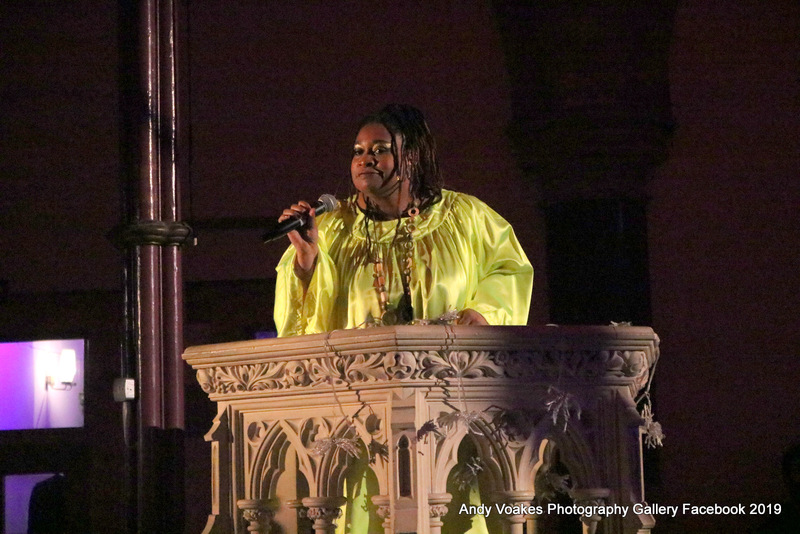 Tracey joined us for our last show she felt moved by the spirit and she moves us in mysterious ways.